We have recently been awarded a LEADER grant for our new Social Enterprise Hub project. The aim is to provide a collaborative, supportive and affordable working space for innovative social enterprises in the Moray area. The hub will provide offices, workshops, spaces for food production/craft activities and facilities such as hot-desking, along with access to social networks, peer support, information and expertise in an environment which will facilitate collaboration, innovation and cross-pollination, thereby supporting Social Enterprises to develop and increase the impact of their work. The award will cover 70% of the total eligible project costs and is worth £369,262. Many thanks to Fasil for organising this successful grant application! Work is due to start on the site (at the rear of the Universal Hall) very soon. 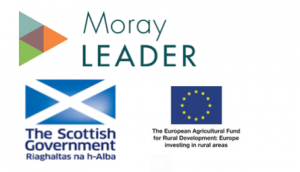 The project is being part-financed by the Scottish Government and The European Community Moray Leader 2014-2020 programme. (See below for the hub design).